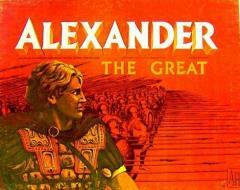 Alexander The Great is a moderately complex wargame recreating an ancient battle on the plain of Gaugamela in 331 B.C. Players take on the roles of Alexander the Great and King Darius III as the Macedonian army clashes with the Persian Host. The game consists of a 22"x28" map board, a sheet of 108 die-cut counters, playing aids, and a 24-page rulebook.